For years, the go-to target audience was “everyone.” The philosophy was very 80s: think of abundance and abundance will happen. Cast a wide net and you’ll catch a lot of fish. The problem, though, is that “everyone” is unrealistic. Not “everyone” needs your product or service. Wide nets are unappealing. These days we see highly specific audiences. The best example of this is the subscription box. There are subscription boxes for readers, self-care enthusiasts, tabletop gamers, makeup mavens, vegans and DIY types. And that’s only scratching the surface. The problem with this highly specific target audience is that it’s easy to run out of new customers. This is why many subscription box companies operate under several different names. Since “everyone” is too large and “just this niche” is too small, finding and marketing content to a target audience is vital. But many companies go about this the wrong way. Businesses often think about how and why to engage in target marketing, but they forget the “who”. The best strategy is to focus specific time on this endeavor. Here are the steps we advise. The very first thing to do is look at analytics. Social media makes this easiest but your website will also tell you things like location. Look at who is engaging with you on social to start to get an idea of your target audience. Social media can give you some great clues to help you learn more about your target audience. Rather than look at the traditional Gender/Age/Location/Income only, dig deeper. Do your customers own or rent? Are they married or divorced? Do they appear to work in a specific industry? What interests do they have in common? As this piece from Lush The Content Agency shows, there can be huge differences between 65 year old divorced men. Combine data to really get a picture. This is how you’ll create “buyer personas”. Notice that Taylor has a gender-neutral name. You might find that you have men and women who are similar so it’s okay to lump them together. You’ll also notice some huge overlap. Your Joes and Taylors are in the same age group, are employed full time, and like live music and dogs. Developing these personas gives you an idea of WHO is checking out your bar. It’s a far better picture than 30-something women and men in your city who make $50,000. If your top two personas like dogs and are employed full time, they might like a dog-friendly bar offering happy hour. So create some content around that! Blog posts about what kinds of dogs should be taken to happy hour with training tips and links to local dog-related businesses are great. Social media posts with cute dog videos are also a content marketing strategy to employ. Maybe consider getting and promoting live music some nights. Figure out the fashion and musical interests of 30-somethings in your area and make sure your ads reflect a similar look. You’ve just gone from generic (gender, age, location, income) to personas and upped your content marketing game in a heartbeat. Your content is now specific to people and interests likely to check you out and has more value. Wait, are you worried about that other large demographic, the one that is very unlike Joe and Taylor? Say you’ve also got Susans. Susans are in their fifties. They are divorced, crafters who work part time, own and enjoy reading, cooking and travel. 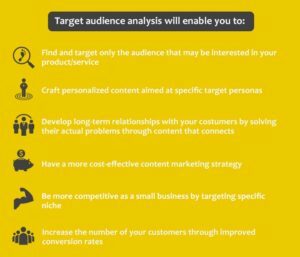 You can create targeted content for your Susans, too. And while your Joes and Taylors are not interested you’ll still reap benefits. One of the coolest things about our strategy for finding and reaching your target audience is that when you take the time to figure out the who, you automatically create more authentic, valuable content. The Joes aren’t interested in doing a paint and sip on a Sunday afternoon, but they might have an aunt or cousin who would love it. And when Joe shares with his Susans you increase your reach. We all spend a lot of time on creating content we think will attract everyone or will attract the niche we think we’re in or that we want to be in. Rather than this, take time to look at actual data and develop personas that help you create valuable, shareable content that will increase your reach and maybe even your revenue. Ready to up your content marketing game? Get in touch with us today.